This is by far one of the best looking and most well designed signs on our website. The sign does not carry too high of a premium, price-wise, but it is a joy to look at. Done is yellow, red, and black, this flange sign advertising Clayton Dynamometer is die cut in the shape of a horse’s head and torso. 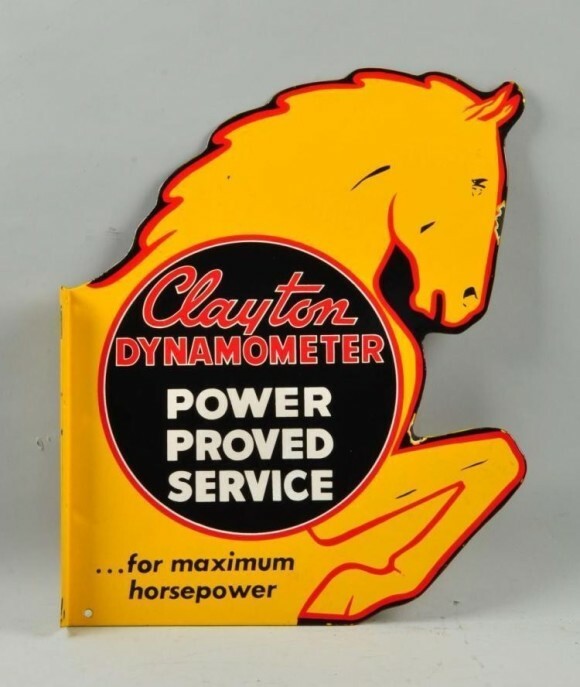 In the center of the torso is a black circle that has red and white text reading “Clayton Dynamometer Power Proved Service…for Maximum Horsepower.” The horse is well designed and this is a great colelctor’s piece.